Hey there! I'm back today for the final day of the August Papertrey Ink countdown. Everything you've seen peeks of will be available tomorrow! And of course I bring you a couple more sample of my new designs for this month. 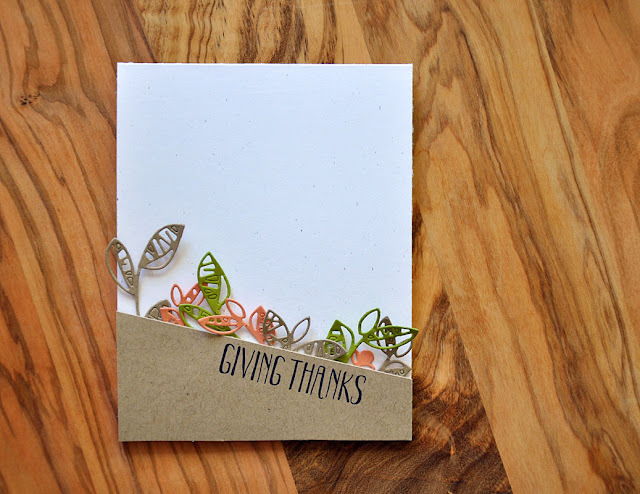 Here I've put to used an extra die cut Splits: Giving Thanks frame that I had laying around. It was stamped in smokey shadow and then I used my color pencils to add a bit of color to the details of the frame. I stamped the "hello" (from the Tropics stamp set) in a contrasting color (Scarlet Jewel) and then mounted it onto the card base at an angle. 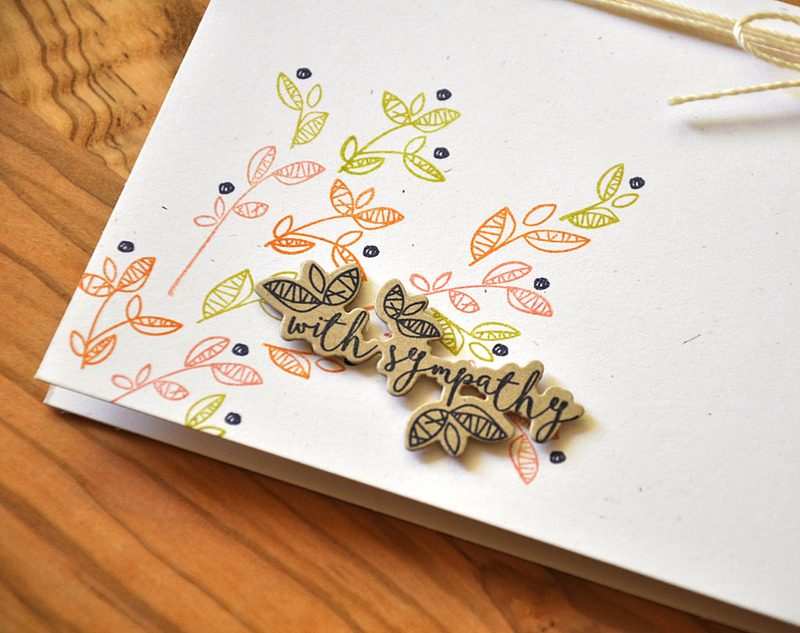 This one-layer number focuses on one of the sentiments from the Fancy Foliage stamp set. The sentiment has built in floral embellishments already placed on either side. 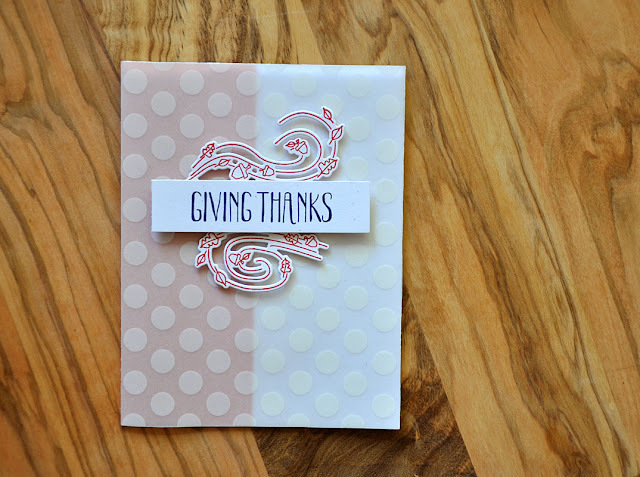 So this card front was stamped only once (super easy!) and then touched up with color pencils. Well, that finishes up this months release for me. Just remember... all that you've seen today will be available for purchase through Papertrey Ink, beginning August 15th. Now, be sure to visit the Papertrey Ink blog for more crafty goodness. Hi folks! Welcome to day four of the August Papertrey Ink countdown. 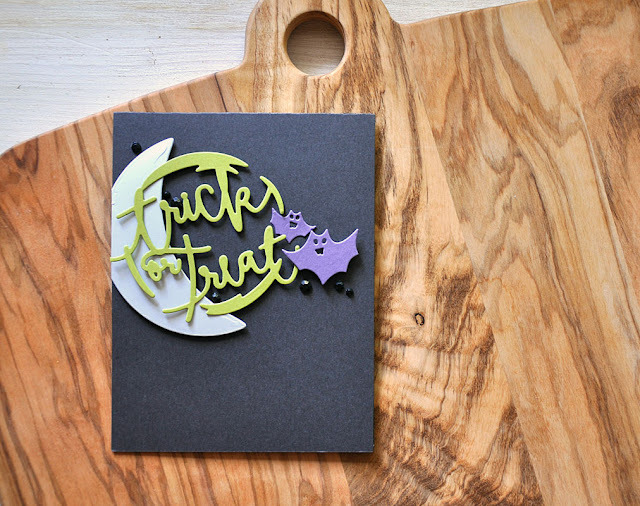 Today's feature is Shaped Sayings: Halloween. The Shaped Saying series has always been full of style, but this particular one includes some fun accessories that bring it to a whole new level! 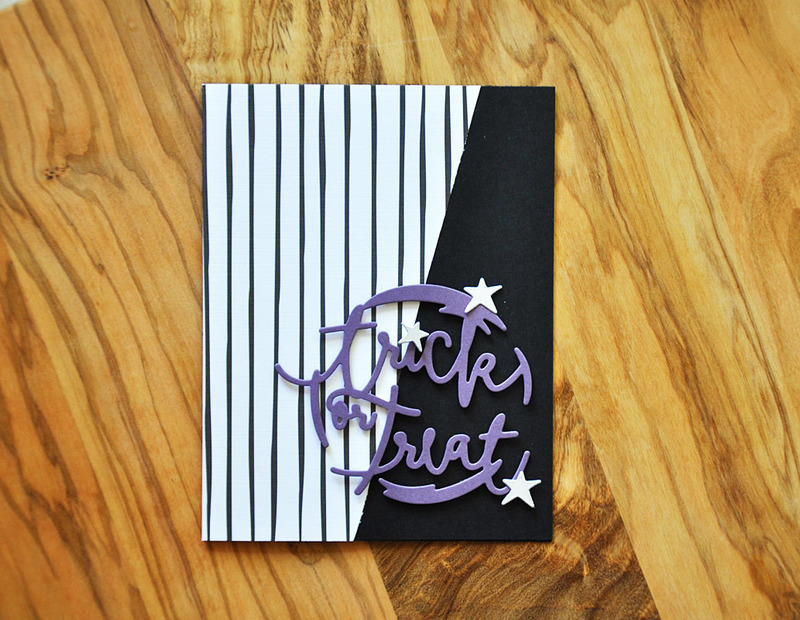 By pairing up the sentiment with a crescent moon, stars and bats, you can do a lot of fun layering and dimension! 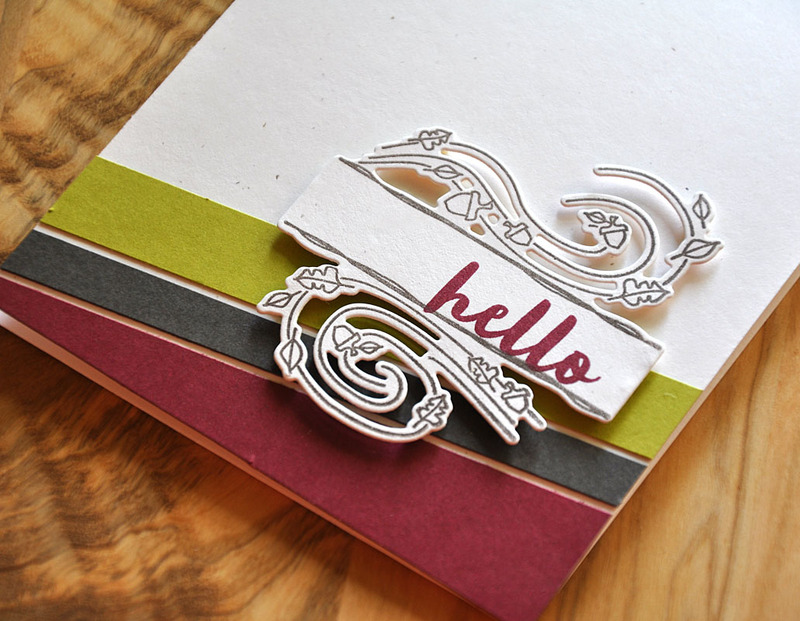 Be sure to visit Nichole Heady's blog for a detail look at these dies. Here's a good look at the crescent moon and bats layered around the sentiment. 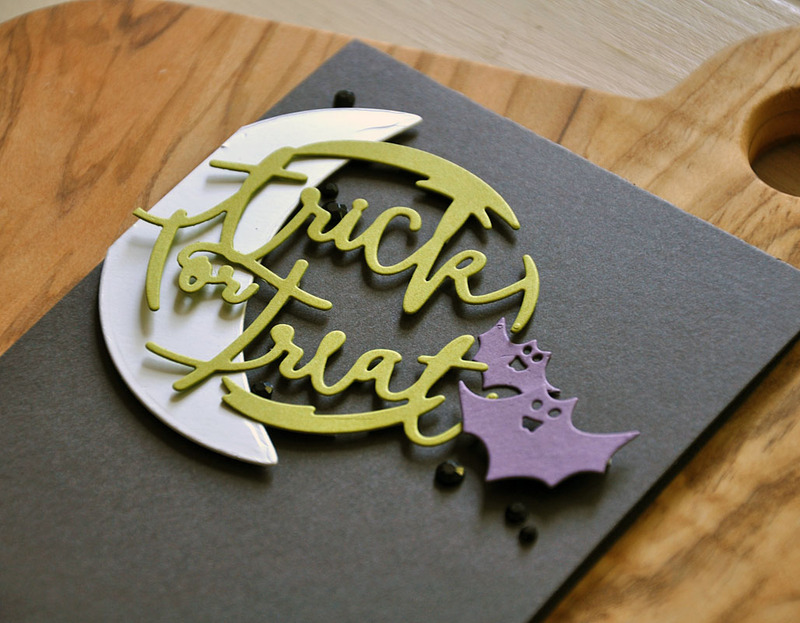 The moon was die cut from luxe silver cardstock, the "Trick or Treat" was cut from Simply Chartreuse, and the bats were cut from Plum Pudding. Between the fun layers I squeezed in a few black rhinestones. Everything was mounted onto a Smokey Shadow cardbase. 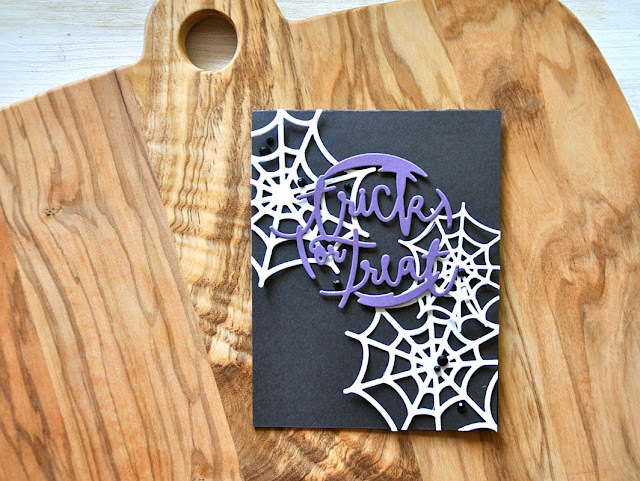 Shaped Sayings: Halloween pairs perfectly with the Spider Web Trio die set too! 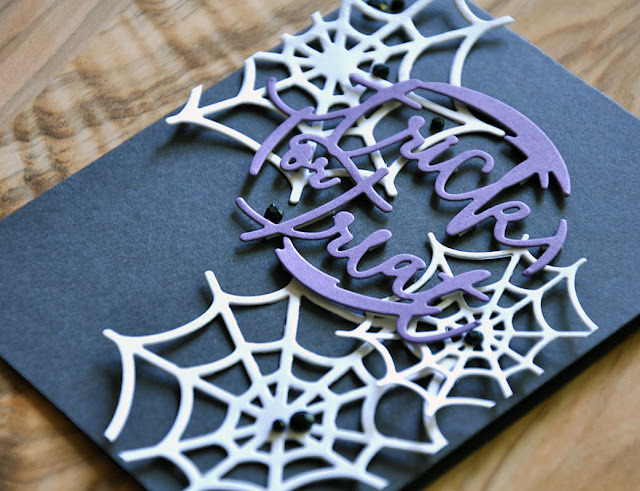 Here I've die cut the spider webs from white cardstock and attached them with a glue dot placed directly in the center. I popped the "Trick or Treat" was attached with a bit of dimensional adhesive and then I finished things off with a bit more black rhinestones. 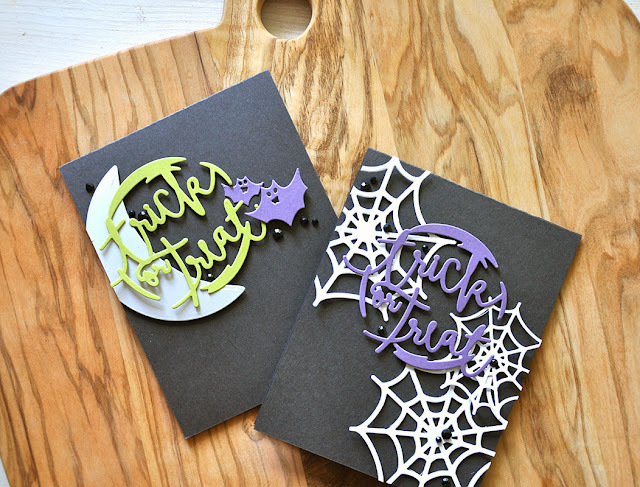 Well, there's a quick look at the Shaped Sayings: Halloween. 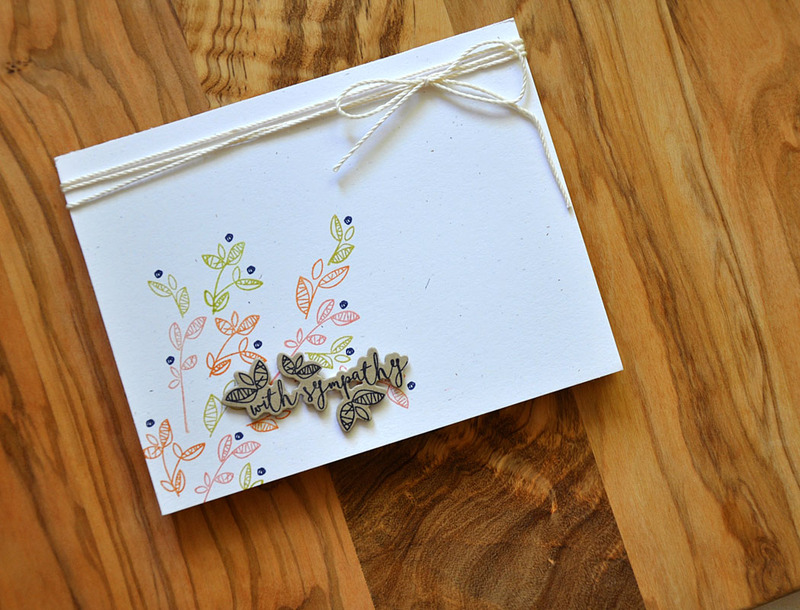 Just remember... this die set will be available for purchase through Papertrey Ink, beginning August 15th. Now, be sure to visit Papertrey Ink blog for more on today featured product. Hi! Welcome to day three of the August Papertrey Ink countdown. 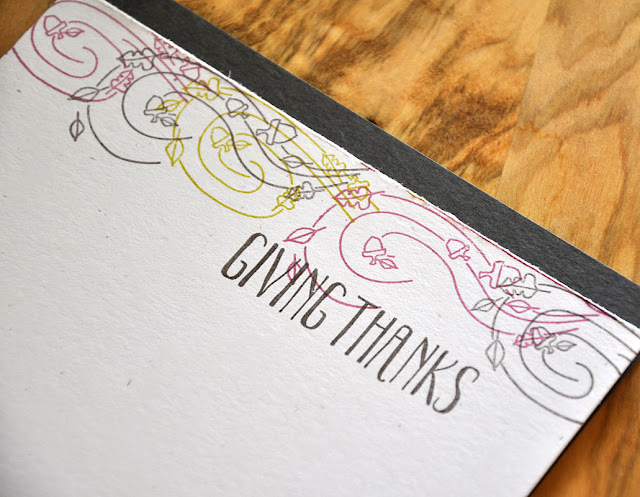 Today I bring you another look at the Splits: Giving Thanks stamp set. The is the 7th set in the Splits collection. I am loving the movement that the swirls of this frame create. Here I've contrasted that with a few solid stripes behind the frame die cut, in a color combo of Scarlet Jewel, Smokey Shadow, and Simply Chartreuse. 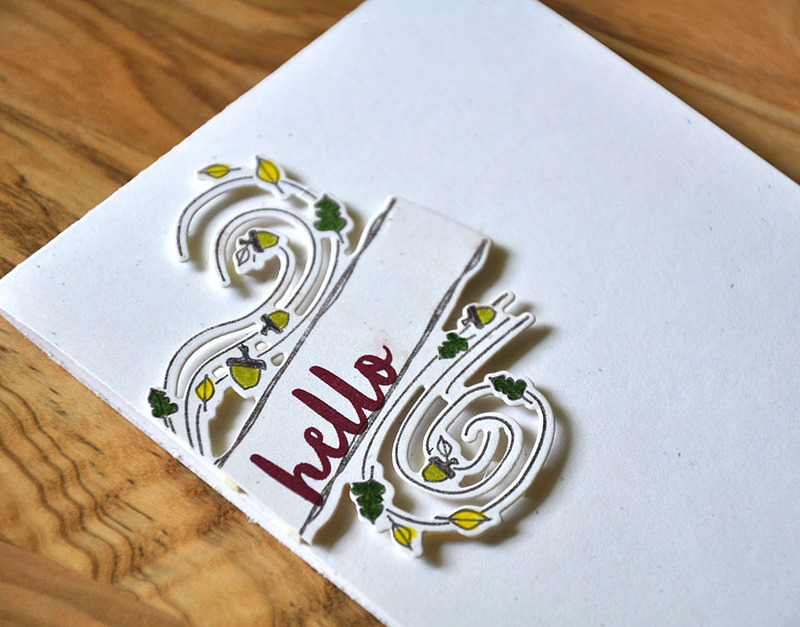 I switched out the coordinating sentiment for a "hello" from the Tropics stamp set. The focus for these two next cards is on using this set in ways other than its original "splits" frame form. 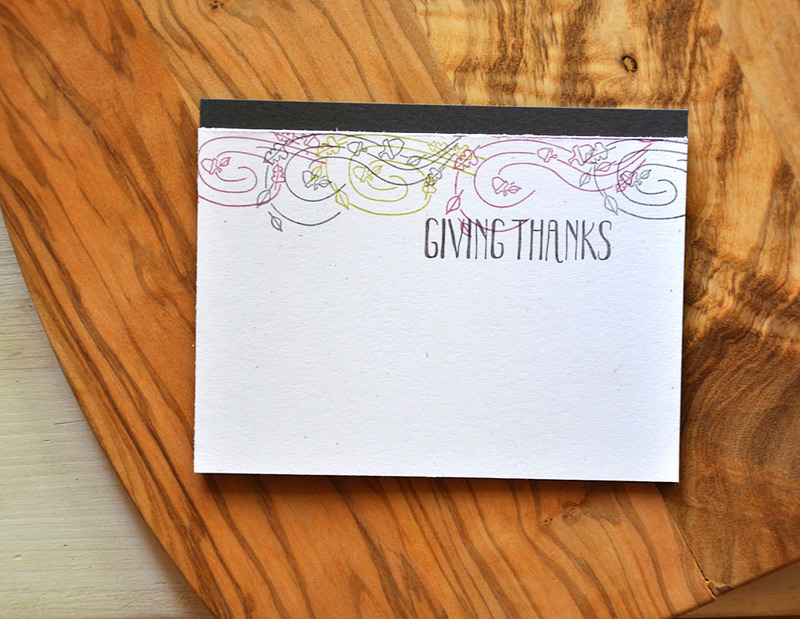 Here I've used both the bottom and top parts and stamped them along the top edge. It adds such movement! Color combo here... Smokey Shadow, Autumn Rose, and Simply Chartrues. Also included in the Splits: Giving Thanks stamp set are lots of little leaves and acorns. These can be used to accent the swirls, embellish the sentiment or on their own. Lots of mixing and matching can happen here! 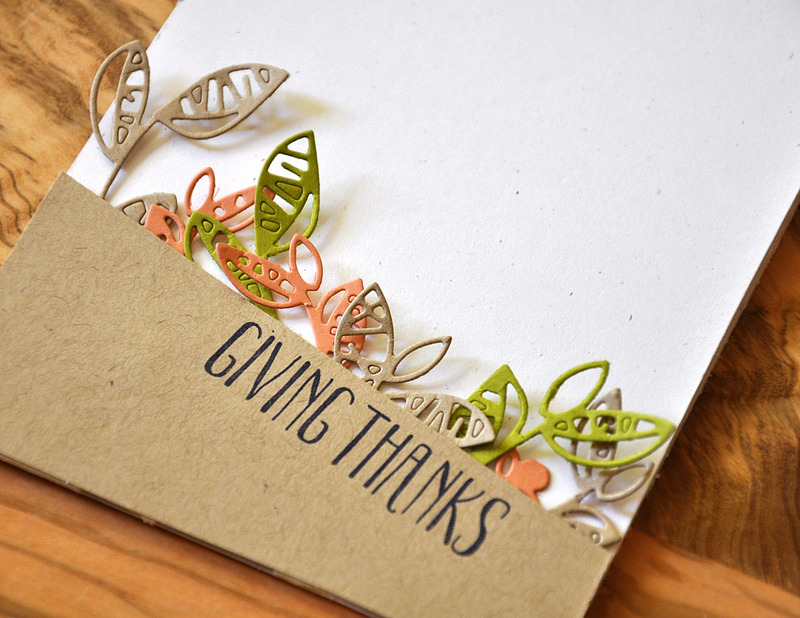 Here I've taken just one of the leaves and stamped a sort of border on either side of the sentiment. 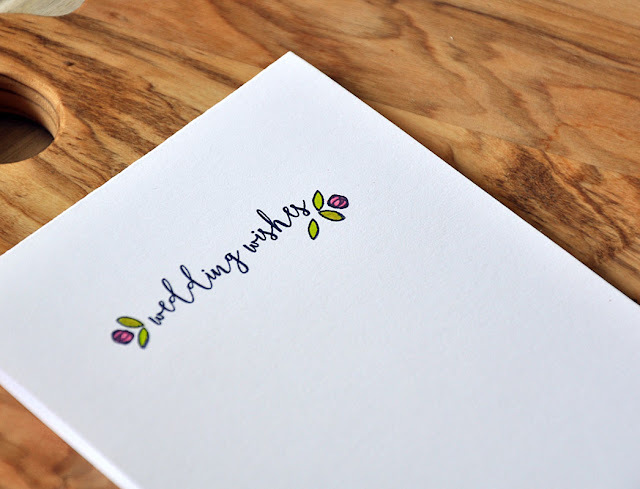 I have a feeling this little figure would make a wonderful bit of hand stamped pattern paper too! Well, there's a quick look at the Splits: Giving Thanks. Just remember... this stamp set and its coordinating die will be available for purchase through Papertrey Ink, beginning August 15th. Hello and welcome to day two of the August Papertrey Ink countdown! Today's focus is on the soon to be released Fancy Foliage stamp set, Fancy Foliage dies, and the Fancy Foliage Details dies. This sentiment stamp set incorporates artistic branches and leaves that have a playful flow. You can build on those arrangements by adding additional sprigs that are separate images. The background on this one was stamped using the additional springs and berry images in a color combo of Melon Berry, Canyon Clay, Simply Chartreuse, and True Black. These separate images are perfect for creating an assortment of patterns, shapes and backgrounds. This background could easily be flipped to create more of a falling leaf look. 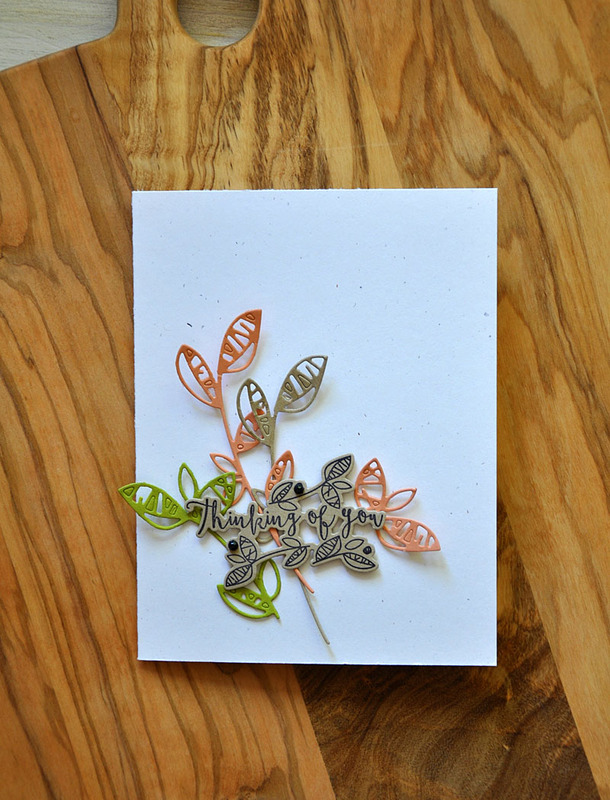 Available separately is a set of dies that recreate the sprigs and all their detail only on a larger scale... 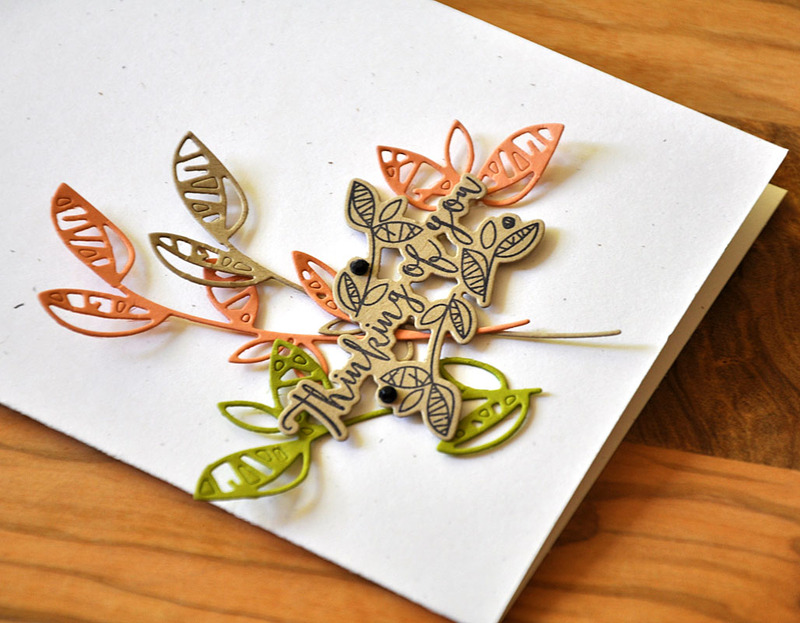 Fancy Foliage Details dies. These pair beautifully with Fancy Foliage! The also look amazing with other stamp sets or sentiment too! Here I've mounted them behind a diagonal kraft colored panel, using a color combo of Kraft, Melon Berry, and Simply Chartreuse. Well, there's another quick look at the Fancy Foliage collection for you. I'll be back tomorrow with more! 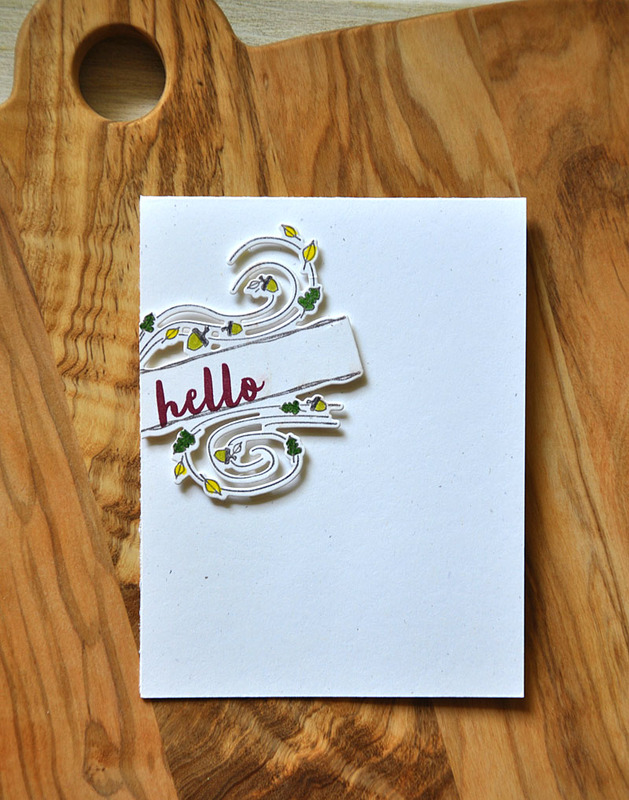 Just remember... this stamp set and it's coordinating dies will be available for purchase through Papertrey Ink, beginning August 15th. 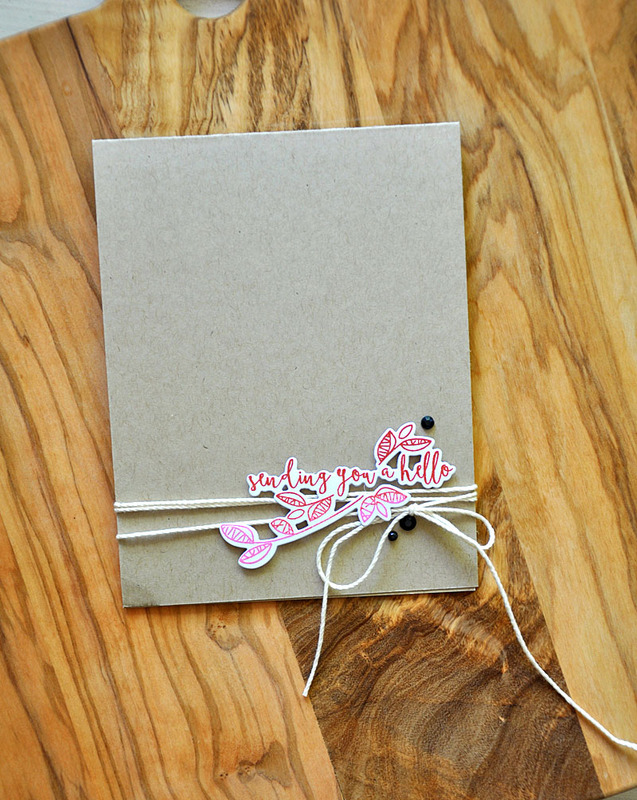 Now, be sure to visit Papertrey Ink blog for more details on these products. Hi there! Welcome to day one of the August Papertrey Ink countdown. For this months release I bring you a few new addition to my Stamping Simply lineup. 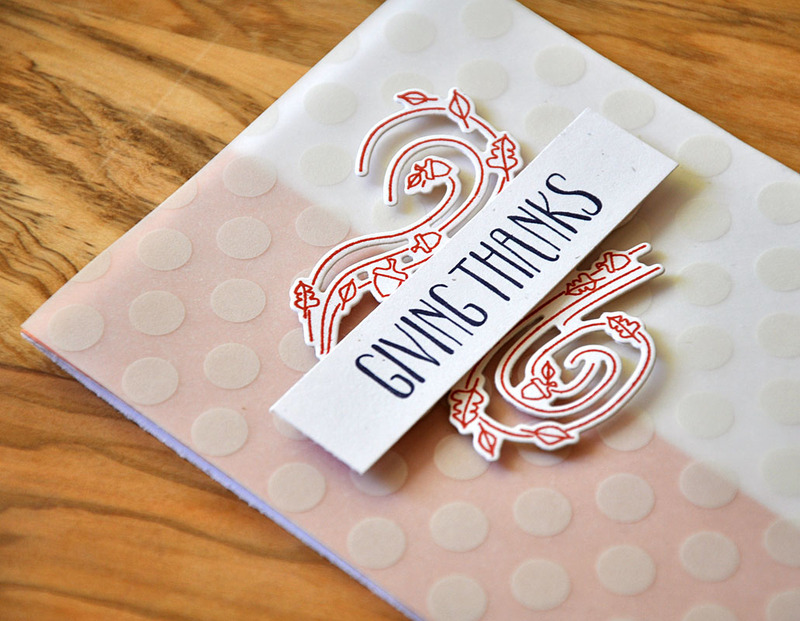 Today I have peeks at the new Fancy Foliage stamp set and die, Splits: Giving Thanks stamp set and die, and the Shaped Sayings: Halloween die. I don't know about you guys, but I've been looking forward to playing around with fall colors! 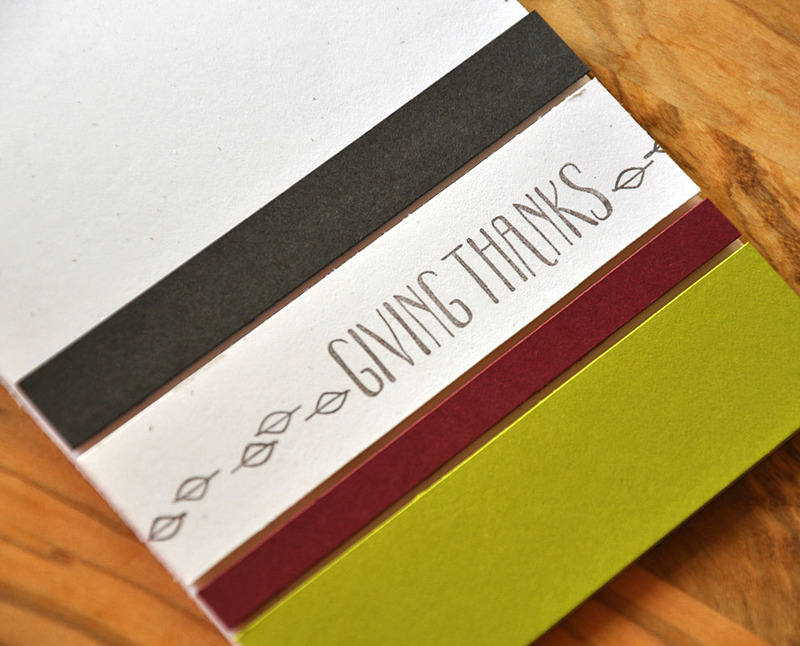 This little combo features a color combo of Terracotta Tile, Hibiscus Burst, Melon Berry, Kraft, Rustic White, and True Black. 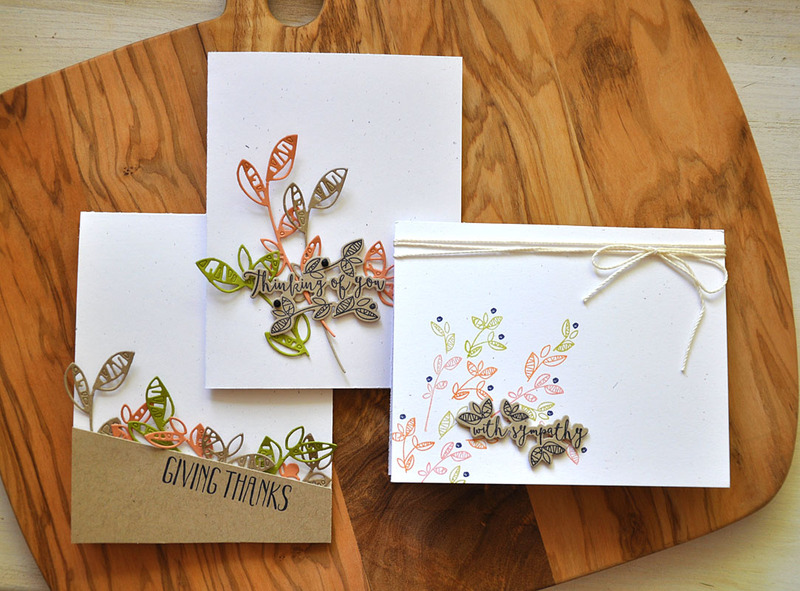 Up first is a peek at the new Fancy Foliage stamp set and dies. It's a modern take on fall foliage, paired with sentiments that are super easy to die cut and use. 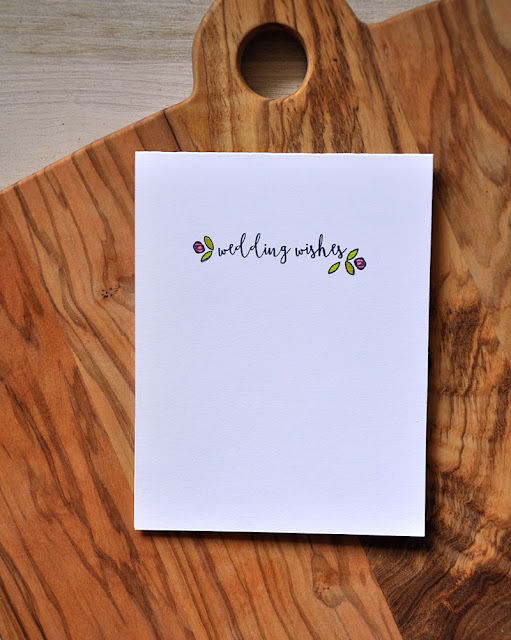 Here I've inked this foliage and phrase combo using a Rock-n-Roll technique in the colors of Terracotta Tile and Hibiscus Burst. Here's the next stamp set in the Splits line up... Splits: Giving Thanks. 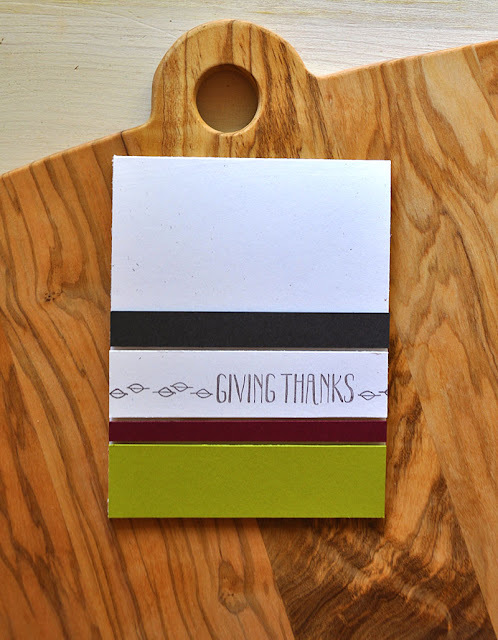 It's perfect for the upcoming fall season or for Thanksgiving gatherings. A Melon Berry panel is attached to a Rustic White base and then covered with a sheet of pattern vellum. The Splits frame was stamped in Terracotta Tile and then partially covered with a coordinating sentiment strip. 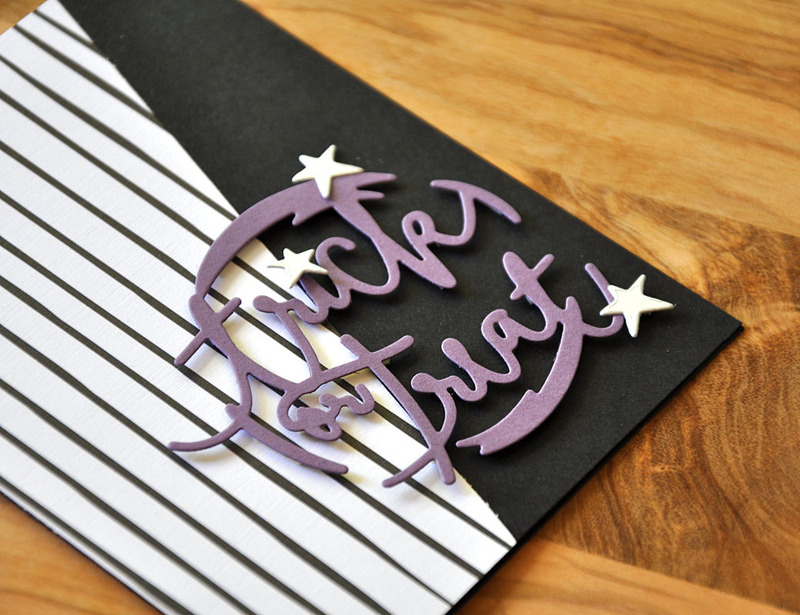 Last but not least, the Shaped Sayings: Halloween die. It's a bit different this time around, more in that later during the release. I paired it with a sheet of striped paper from the Black and White All Over paper pad. 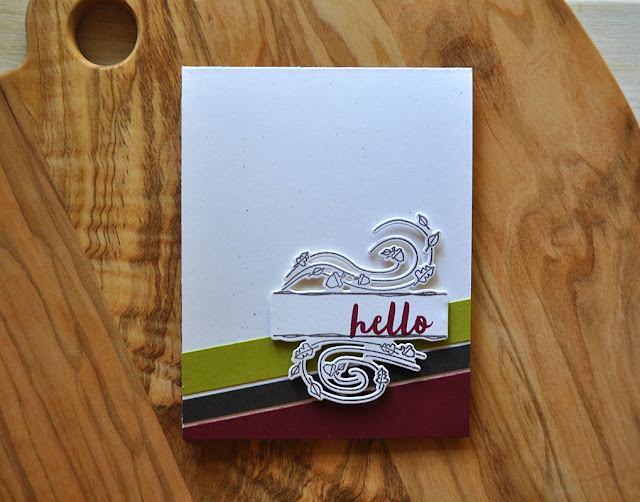 Well, there's a quick look from me at the latest from my Stamping Simply lineup. 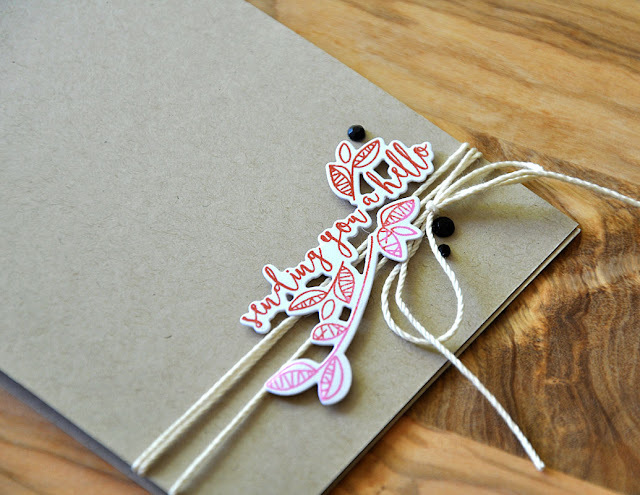 Just remember... everything showcased today will be available for purchase through Papertrey Ink, beginning August 15th.